With recent events, I feel this topic is necessary. What I'm referring to is the leaked 2016 poster featuring the island of Mata Nui from G1 on the Mask of Control's forehead. Please bring any theories and/or discussions on the 2 generations being connected over to here, to keep the already hectic 2016 topic.. uh.. slightly less hectic. A Call to Action: Let´s solve the G2 story! I find it hard to believe it's a placeholder. They have access to Okoto. They'd use that. Wow, @John_Sheppard just got Kapura'd. The Toa might just be going to a new Island, shaped similar to that of Mata Nui. that @John_Sheppard guy needs to get off my back before I go crazy on him. If G1 and G2 are connected then I would like it to be that the island of Mata Nui is still destroyed and the island of Okoto was formed out of the rubble over millions of years (because mata Nui was broken by the great spirit robot rising right?). The Toa vs Makuta will keep recurring through time like it is part of that worlds nature. It's inevitable and has and will always happen, in different form every time. It's not a continuation, saying that right now. My guess is that the island is simply an homage to the original, even more so that Okoto, and will be our answer to "Are there any other lands/islands out there?" Coming back to one of my earlier theories, let's say that the Toa complete their mission on Okoto after Bionicle's first three years, all the while regaining their memories of themselves and their home, Spherus Magna. Then BOOM, they realize that the Makuta was only a pawn for something larger, a truly evil entity I'll refer to as...wait for it...the Kraahkan. That's right, the original Mask of Shadows, otherwise known as the Mask of Ultimate Power. 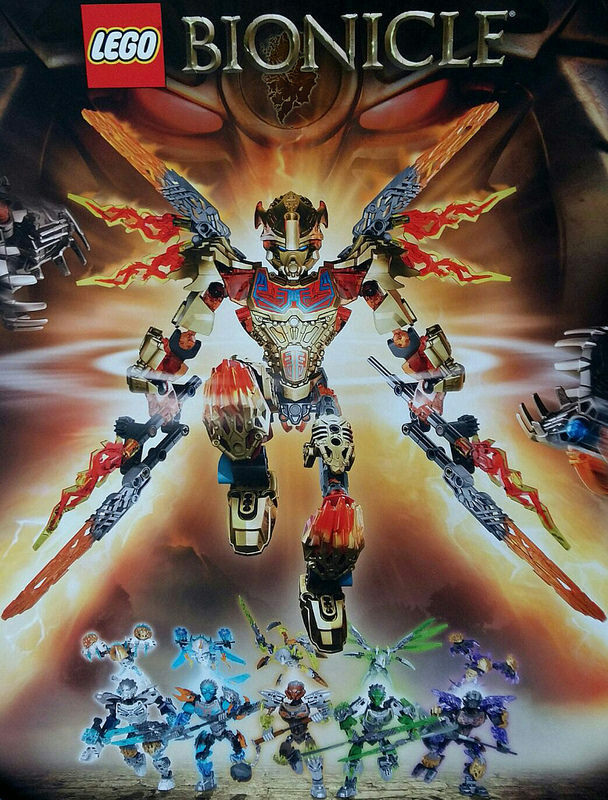 Created by Gen 2 Makuta out of pride and jealousy from Okoto and his brother, the Kraahkan takes over Makuta and is only stopped by Ekimu, who sends the mask into three pieces: the Mask of Incineration, the Mask of Fragmentation, and the Mask of Maelstrom. These Masks each contain sentient minds, and eventually evolve into the Lava, Quake and Storm Beasts. The controlled Makuta used Umarak to hunt down its' three components and recreate itself. The Mask of Ultimate Power then takes over Makuta once more and defeats the Toa (Nuva). Ekimu steps in to fight, but can barely hold his own against the Mask's power combined with Makuta's. But Makuta regains his mind and resists the Mask, giving time for Ekimu to wrench the Mask from his face. The dark energy unleashed shatters the Mask of Creation, however, and Ekimu falls. The Mask absorbs the power of the MoC and disappears. The Nuva mourn for Ekimu and their defeat. But Makuta tells them that while the MoUP was controlling him, he discovered that the mask wished to 'return to its owner'. The Nuva ponder this, and Kopaka remembers Teridax. Makuta believes that the MoUP can bring the dead Makuta back to life, which would mean the end of both worlds. But Onua suggests that the Toa combine their powers to return home, and says that there is a mask known as the Mask of Life that may be able to revive Ekimu inside of Teridax's robot body. With that in mind, Makuta travels with the Nuva back to Spherus to stop the MoUP. Kind of hard to follow, I'm aware, but that's my two cents. This was an idea I put in the BIONICLE 2015 Discussion topic, but I was told it was had no place there. But now that you've created this topic, it may have a place. (NOTE: If you have seen this idea before, I've edited it a bit). Maybe the power of Mata Nui's robot and the Mask of Life not only restored life on Spherus Magna... but also created Okoto. See the ocean behind Tahu in this picture? I thought, "If there are still large oceans on Spherus Magna, is it possible there could be places even the G1 Toa don't know about? Things created by the Mask of Life and Mata Nui in their last move to restore life to the planet? An island? Perhaps... Okoto?" and two brothers the Mask Makers founded Okoto? Using the Mask of Control, maybe Makuta managed to control the island's broken fragments to bring them together. Then, Ekimu used the Mask of Creation and created a series of mountain ranges to hold the island (Okoto) together. Oh sure, now I notice the island of mata nui on the mask. WHY ON EARTH IS IT THERE!?!? It has to be a place holder. Or maybe it's an Easter egg like the Vahi? GAH, MY BRAIN IS MELTING RIGHT NOW! And I am going to speculate that if this is the case, the Toa Mata turned into Turaga somewhere along the line and trained the Masters to go take care of Okoto. Mata Nui... Why Mata Nui? Hmm... Perhaps Okoto's original shape was that of Mata Nui? We dunno. However, I have a feeling that this will lead to further links of Generation 1 and generation 2. The practical side of me is saying: this is just an Easter egg or homage. While the bionicle fan in me is running around the screaming in delight. The "Beasts" have power over nature right? What if they create a Mata-Nui replica off the coast of Okoto? Better yet, maybe the "Beasts" are mutated Element Lords? What if Ekimu and Makuta were related to Artakha in the Matoran World? "The mask was the most ornate anyone had ever seen – more than just a Kanohi, it was a true work of art. The metallic protodermis from which it was forged was arranged in intricate patterns and designs, each reflecting one of the many cultures that flourished in the universe. The eye slits were angular and pointed, giving him an air of both wisdom and a vague sense of menace." EDIT: Any ideas on how Karzahni fits into the picture? Vakama attempted to create a legendary mask during his task to create the Mask of Time. The result was the Mask of Control, but unpleased with the result, he dumped it. When Dume/Makuta visited the forge to question Vakama about the Mask of Time, Dume took the Mask of Control with him, a mask which would be locked in a vault, saved for centuries to come. IF there is a connection to G1 in G2 then here is my theory: someone found and mastered the Vahi, then sped up time until reality rebooted, resulting I a new reality. In other words: someone pulled a Made In Heaven. Why yes I am a JJBA fan.